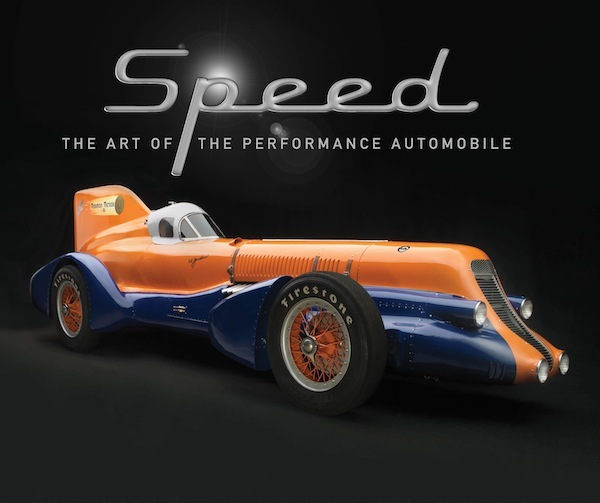 During the summer of 2012 the Utah Museum of Fine Art joined the growing list of regional art museums embracing automotive themes with their exhibition Speed: The Art of the Performance Automobile. A book of the same name was produced to serve both as the exhibit catalog and as an independent detailed look at the nineteen cars in the exhibit. In the 144 pages there are new studio photographs, period photos, essays on each car, one foreword by museum director Gretchen Dietrich, a second foreword by John Price, a glossary for the new-to-cars reader, and a useful bibliography. The book follows the template established by the two versions of The Allure of the Automobile (High Museum of Art, 2010 and Portland Museum of Art, 2011) in dimension, page count, and general organization. It was produced by Peter Bodensteiner’s Stance and Speed publishing house with design by Tom Heffron. 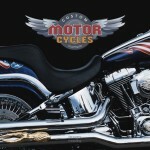 The production values are high with crisp design and good-quality reproduction of photographs. Speed fares well in the obvious comparison with the Allure books and has an advantage in visual continuity (Allure resorted to a couple of odd lots of photographs). Ken Gross, who served as both the guest curator of the exhibit and author of the book, is widely acknowledged as a leading authority on everything automotive. Here again, the text is informative and entertaining. Gross, in his role as curator, made the selection of the cars and the cars are the stars. Most of the nineteen are purpose-built racecars and others, such as the Cord 812, have significant race history. Seven of the cars have a connection with the nearby Bonneville Salt Flats including the show’s centerpiece Mormon Meteor III, a monumental aircraft-engined car constructed by Augie Duesenberg and local hero Ab Jenkins for a series of record attempts during the late 1930s. The car, also featured on the book’s cover, is recently restored and, at nearly 30 feet long, has a commanding presence—in the book and in real life! Other Bonneville cars include the very aero Chet Herbert Beast III streamliner, the iconic SoCal Belly Tank, the Jim Khougaz roadster, and the Speedomotive streamliner. Non LSR gems include the Louis Chiron 35B Bugatti, an elegant front-drive Miller 122 Indy car, an imposing 4½L Blower Bentley, a Cobra Daytona Coupe, and the Steve McQueen Jaguar XK-SS. The chronology begins with the Barney Oldfield 1904 Peerless Green Dragon and ends with the Al Teague Speedomotive Special Streamliner that ran at Bonneville in various forms from the mid 1970s through 2002. 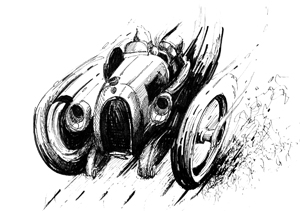 The nineteen chapters are grouped in four sections; Speeding into the Century, The Golden Age of Racing: 1920s and 1930s, Bonneville: The Crucible of Speed, and Speed and Performance for the Road. Curious minds might wonder what conceptual thread connects the 375MM Ferrari with the Speedomotive streamliner but, what the heck, each is spectacular in its way. It should be noted that this book and exhibition, along with similar museum shows, could not happen without the willingness of the cars’ owners to share with the public. Lenders to the exhibit include Bruce Meyer, Peter Mullin, Richard Munz, Mark Brinker, Harry Yeaggy, Jon Shirley, the Larry Miller family, the Petersen Automotive Museum, the National Automobile Collection, and the Price Museum of Speed. John Price, Utah businessman, philanthropist, ambassadorial appointee under U.S. President George W. Bush, and avid car enthusiast was the prime mover for the Speed exhibit and book. Ten of the museum’s 30 cars are included here. Ambassador Price is also a supporter of environmental efforts to preserve the Bonneville Salt Flats and producer of the The Boys of Bonneville, a film that documents \ both Ab Jenkins career and the restoration of the Mormon Meteor III. Of the nineteen featured cars, eighteen were photographed by Peter Harholdt and one is from the archive of Michael Furman. Harholdt’s work conveys a sense of form, scale, mechanical nuance, and material. Many pages here have a tactile appeal. Quoting Bob Varsha from the publisher’s promotional material: “The effect is that of being alone with the car in a quiet room, learning its story for the first time.” Again, there is a combination of descriptive overall shots, evocative abstractions, and mechanical detail. The book performs an important function in giving the viewer the sort of access that is not possible at the exhibition. We see, for example, the stark purposeful cockpit of the Cobra Daytona Coupe, the exquisitely sculpted engine of the Miller 122, and the ingenious front wheel arrangement in the Speedomotive streamliner. The images benefit from Harholdt’s experience as a racer and car builder plus his years of museum photography for the Smithsonian, Louvre, MoMA, etc. It is widely known (among the tens of people who follow such things) that Harholdt does most of his work with the so-called “mobile studio,” a cargo trailer that sprouts an articulated light bank, backgrounds, and everything else that might be found in a permanent studio. You’d never know that most of the pictures in this book were taken in parking lots, driveways, and warehouses! The bottom line, however, is the quality of the resulting images—the novelty of clever techniques is only a footnote. Harholdt, having done several notable books with this apparatus, has made his point. Having observed several of these photo sessions, I have to wonder how many more of these projects he will do before he retreats to the comforts of an air-conditioned studio or, more likely, disappears into his race shop. For now though, he has demonstrated in this book his skills and his appreciation for these cars. The 1937 Type 145 Delahaye uses the photographs of Michael Furman. Furman has been the photographer of choice for major collectors including Peter Mullin and Frederick Simeone and has himself been principal photographer for museum exhibits. His images are technically meticulous, devoid of artifice and gimmickry, and are a faithful, albeit arms-length, look at the car’s design. The ex-Rene Dreyfus “Million-Franc Delehaye” pictured here is representative of his work with two overall views and a number of details. Ken Gross, along with Harholdt in most cases, has produced a number of automotive theme exhibits for fine arts museums with satisfying results for the museums, enthusiasts, and the traditional museum audience. Several more exhibits are reportedly in the works at regional museums around the country. One would hope that some time soon they will escalate the effort to a larger theme and more rigorous scholarship with a national museum as a venue. For now, we look forward to their next collaboration and happily add this fine book to our collection. Copyright 2012, Vaughn Miller (speedreaders.info).